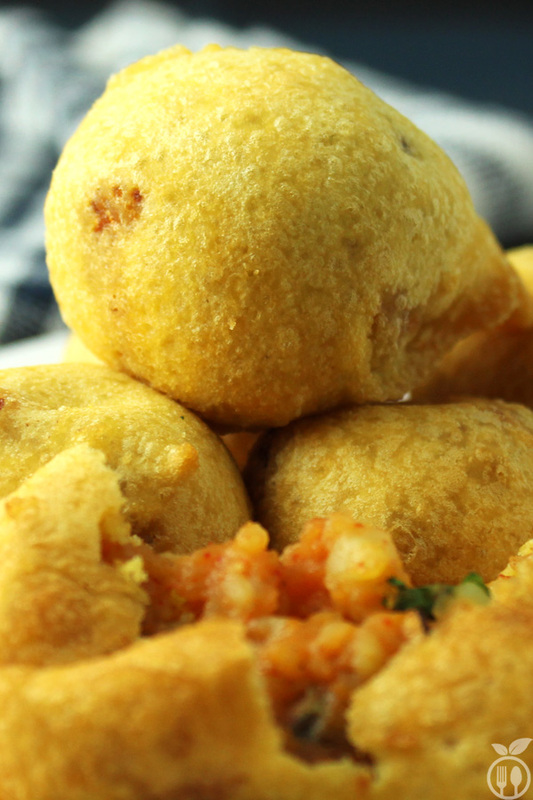 Batata Vada Recipe (Crispy Potato Fritters) is a popular street food snack from (Maharastra) Mumbai, India. This recipe is a Mumbai Style street food that goes beyond all geographical and cultural barriers and becomes world famous. 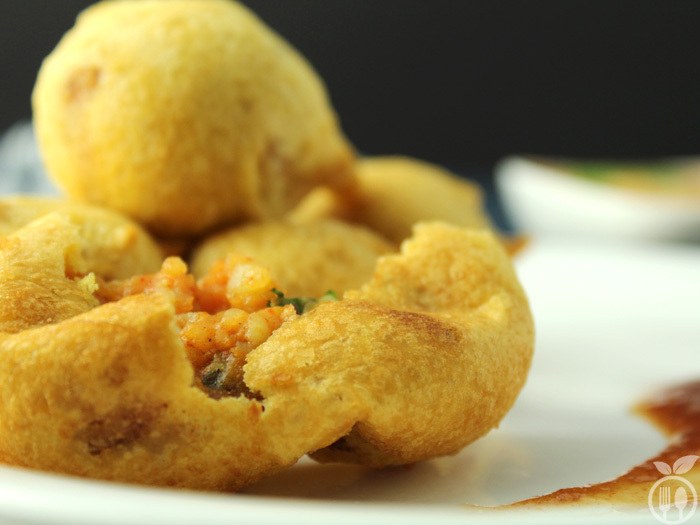 This is the savory appetizers – crispy fritters cooked with mashed potato balls encased in a gram flour batter (chickpea flour) and deep fried into oil. Since last 2 months, I made my website, verities of recipes and across this journey, I found that Indian snacks, especially Mumbai snacks are very famous world-wide. Once I was watching an international food channel program in TV, and you don’t believe that SAMOSA recipe is awarded by some London food critic as best snack all across the world. Strange! Isn’t it! I am very happy that people started liking Indian Food. And this encourages me to share more tempting and mouth-watering Indian snacks recipes with you!!! If I am making list of only Gujarati snacks, then it can be a hundreds of recipes that evenly delicious and tasty. This is my mother-in-low’s authentic recipe that I am gonna share with you. In my family, every week, my in-lows says, lets cook something different from regular menu, then that’s signal for me its demand for Batata vada !!! Most of time, when I cook this recipe, (Sorry, my mom cooks it as it is her authentic recipe), I always do some experiment on this basic recipe. 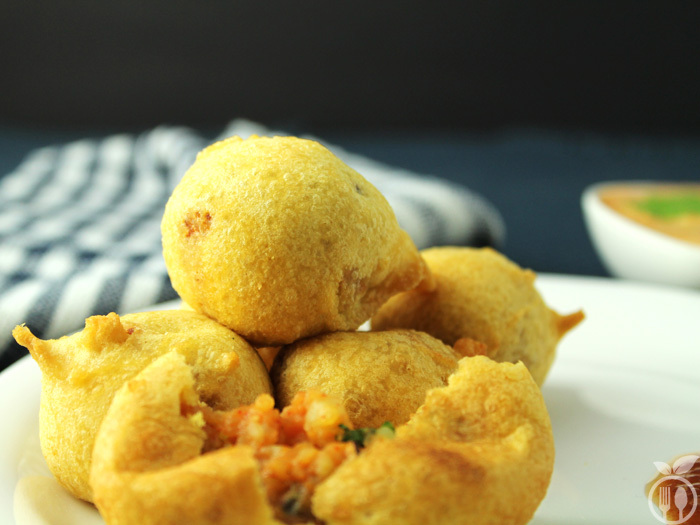 In this post I am sharing my mom’s authentic recipe of Batata Vada Recipe. But stay connected for my own version (sorry versions) of Batata Vada Recipe in future. 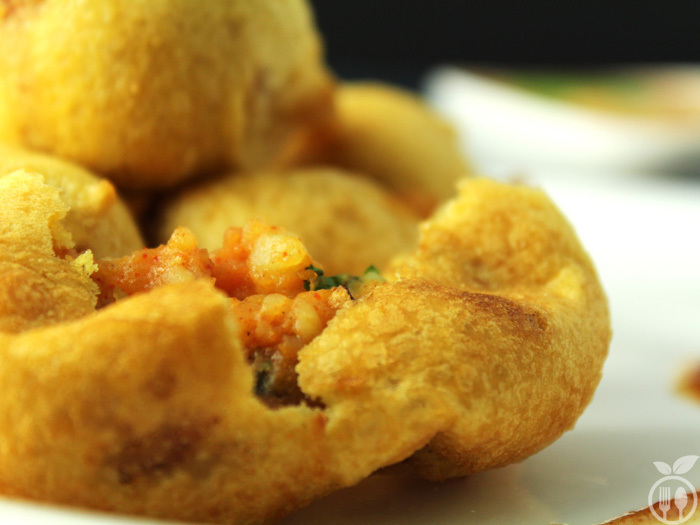 Batata Vada (Crispy Potato Fritters) is a popular street food snack from (Maharastra) Mumbai, India. This is the savory appetizers - crispy fritters cooked with mashed potato balls encased in a gram flour batter (chickpea flour) and deep fried into oil. In large bowl, take mashed potatoes and add all other ingredients (green chili paste, ginger paste, turmeric powder, red chili powder, GARAM MASALA, sugar, lemon juice, salt, finely chopped parsley). Mix them well into potatoes. Now make small balls from it. Around 10-12 balls can be made from above measurement of mixture. Take another bowl. First take baking soda and salt, now add lemon juice and immediately add half cup of water into it. Take gram flour into this mixture and add remaining half cup water to make thick batter to coat the potato balls. Take more water if required to adjust the consistency of batter. Keep in mind that consistency of batter must be like condensed milk. Keep stirring the batter so that lumps cannot be formed, put batter aside for at least 10 minutes. In frying pan, heat the oil on medium flame. Dip the potato balls into the prepared batter and fry into oil, on very low flame. And fry until they turn into light brown color. It may take 2-3 minutes . 1) You can serve this hot potato vada with green chutney or tamarind-dates chutney or with curd. 2) It simply tastes so good with cup of tea. This is very easy and quick recipe. You can change the taste accordingly. The critical part is creating batter. Don’t forget to add baking soda or fruit salt or soda by-cab into batter. The consistency of this batter is also giving it good texture. You should keep up the consistency of batter as like condensed milk consistency. Don’t make it thinner. The spiciness of the stuffing is up to you, if you like more spicy than add more chili powder or if you don’t like more spicy (as I am) avoid red chili powder. I suggest that don’t avoid sugar content in this recipe thought it is optional. It will balance the tanginess and spiciness of this recipe. I have tried to make batata vada with your recipe for my sisters on Raksha bandhan. It seems there is a typographical error. I added water 2 cups for 2 cups basan. Though you have mentioned that the batter should be as thick as condensed milk, I gave moe importance to your suggested proportions, I failed to deliver. Pl check and confirm I feel water should be half a cup or less for each cup of besan. 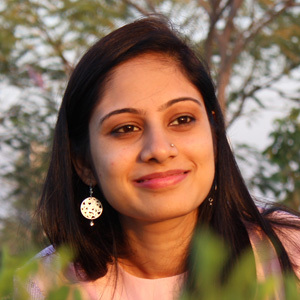 I shall appreciate your comments/suggestion. First of sorry for spoiling your Raksha bandhan. yeah, batter consistency is depends on amount of water. sometimes, types of besan also affects the water measurements. If your besan is fresh it requires less water, and of besan is old than more water required. So, while making the batter, take amount of batter mentioned in any recipes, and slowly add little by little, and mix it well, if you get the desired consistency stop adding more. I hope this tips will help you in kitchen next time.